« Were you an Activision Master Gamer? Yesterday I began my look at Activision’s Master Gamer Program. I looked at the Activision newsletter and talked about the genesis of the Master Gamer badges. I also showed you five of those Master Gamer Badges. Click on this link to go back and read Part I of this article if you missed it and see badges for the games Dragster, Barnstorming and Freeway. Now, without further ado, here are five more of the Activision Master Gamer Badges. You can click the images to make them bigger and thanks again to Atari Age for the game box scans. Grand Prix Driving Team Master Badge – For the game Grand Prix. This was a typical racing game where you drove to be the first across the finish line while swerving in and out of other drivers and avoiding hazards like oil spills. This was one of the first games to start awarding these Master Gamer patches. 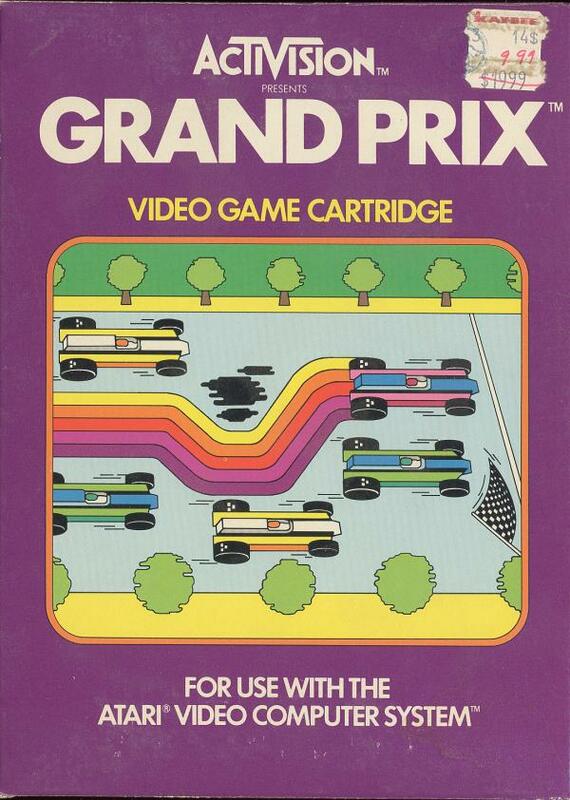 If you ran your race in 1:00 for Game 1, 1:30 for Game 2 and 2:30 for Game 3, then you became a member of the Activision Grand Prix driving team. 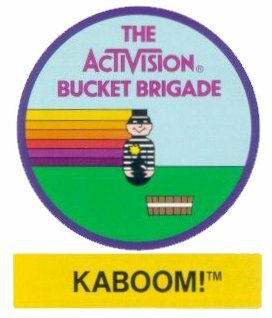 Activision Bucket Brigade Master Badge – For one of my favorite Atari 2600 games of all time, Kaboom! 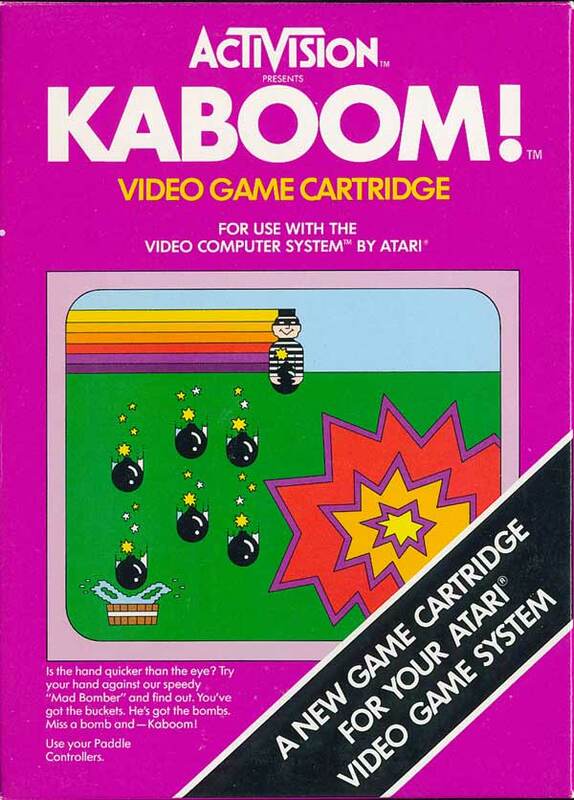 In this game, you use the paddle controllers to control buckets on the bottom of the screen to catch bombs that are dropped by the bandit at the top of the screen. It’s much harder than you think it is. My grandmother gave me this game for Christmas one year and I’d never heard of it. It quickly became one of my “go-to” games that I would play for hours. To earn this badge you have to score at least 3,000 points. 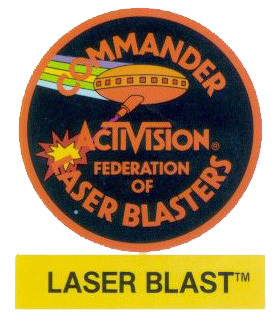 Commander in the Federation of Laser Blasters Master Badge – For the game Laser Blast. 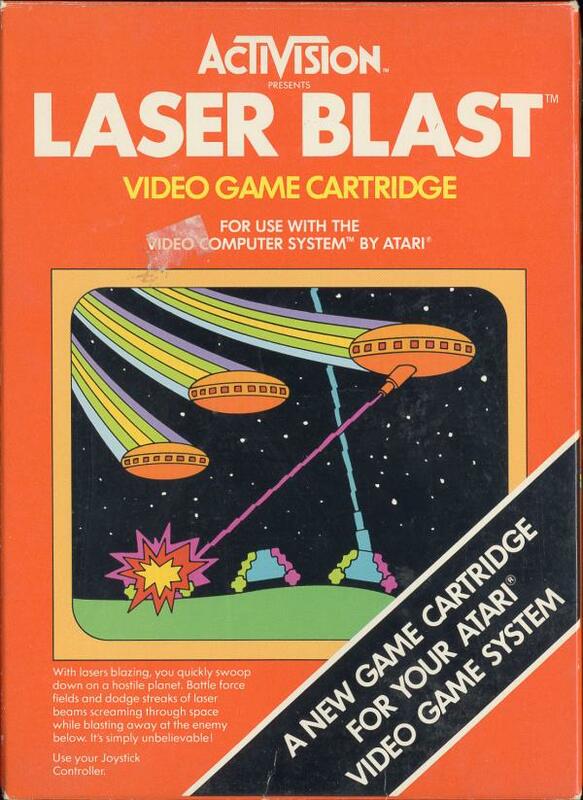 This was a space shoot-em-up in the vein of Missile Command. If you could score over 100,000 points, you earned this commander badge. Additionally, the on screen display could only accommodate 6 numbers. So if you scored over 999,999 points, your score would flip to all exclamation points. If you could do this, there was an extra 1,000,000 point patch you could earn. 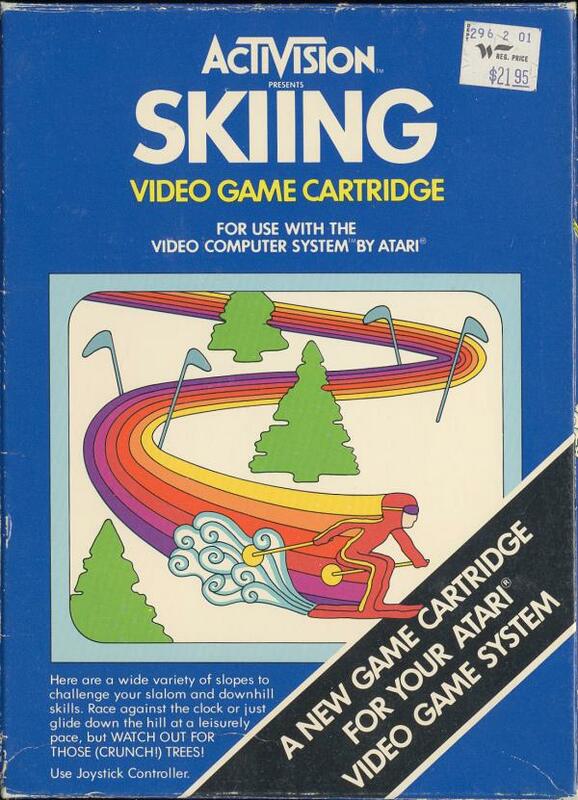 Activision Ski Team Master Badge – For the game Skiing, one of the few games featuring the winter sport of skiing for the Atari 2600. This game offered several different downhill races you could do, all timed and the goal was to beat your times. 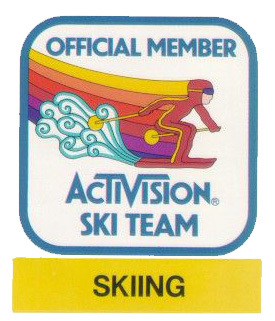 If you could beat the time of 28.2 seconds on the slalom, you would earn the Activision Ski Team badge. 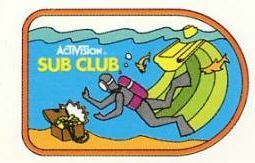 Activision Sub Club Master Badge – For the game Seaquest. This game worked very similar to the Atari port of Defender. It was a shoot-em-up. 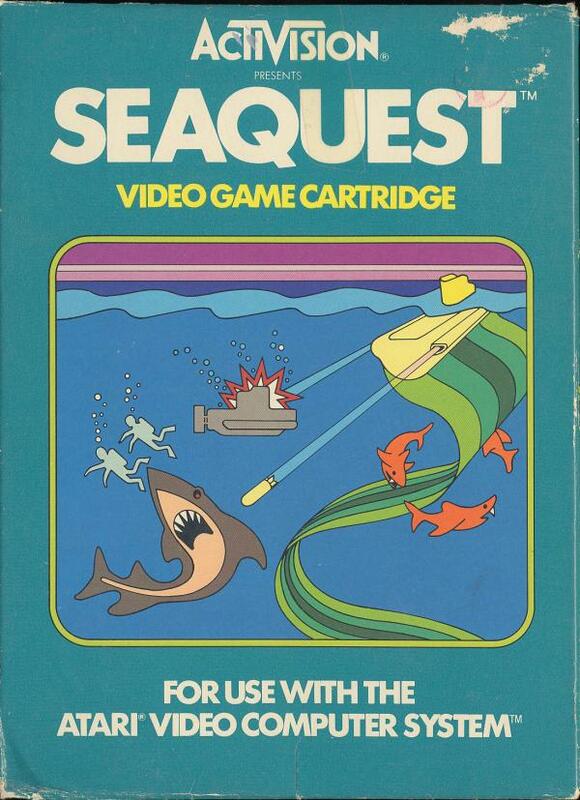 You pilot a submarine shooting sharks and enemy subs while simultaneously saving friendly divers. If you could score 50,000 points then you earned the Sub Club badge. Those are your five badges for today. I have five more badges for you tomorrow. Stop back tomorrow to see what other Atari games are represented. This entry was posted on September 8, 2010 at 9:45 am and is filed under 80s, Activision, Atari, pop culture, video games with tags Activision, Atari, Cavalcade Arcade, nostalgia, pop culture. You can follow any responses to this entry through the RSS 2.0 feed. You can skip to the end and leave a response. Pinging is currently not allowed.